With my nesting in full gear, we’ve been making steady progress on replacing the baseboards and door frames while moving stuff out of the craft room to make room for the baby furniture. We’ve decided to keep the big boys in a shared room, Keaton in his own room and the baby will take over the room full of boxes that haven’t been opened since our move craft room. We’ve even installed a dimmer switch and new light fixture in the soon-to-be nursery. Yes, we were making progress. Then one night I decided to do a load of laundry before going to bed. As we sat in bed I told Chris that I thought the washer was unusually loud. He agreed and went to check it out. Then, he yelled my name. Never good. Ever. By the time I got to the laundry room, there was an inch of water filling it and creeping into the hallway. Worse, I could hear a fire hose down in the living room. Chris ran down as I began to clean the laundry room with towels and steam cleaner (sucking up gallons of water and dumping it in the sink – thank God for a sink in the laundry room). Then another yell from Chris, this time it wasn’t my name through, it was the sound of pain accompanied by a loud thud. When I ran downstairs, he was just getting up. 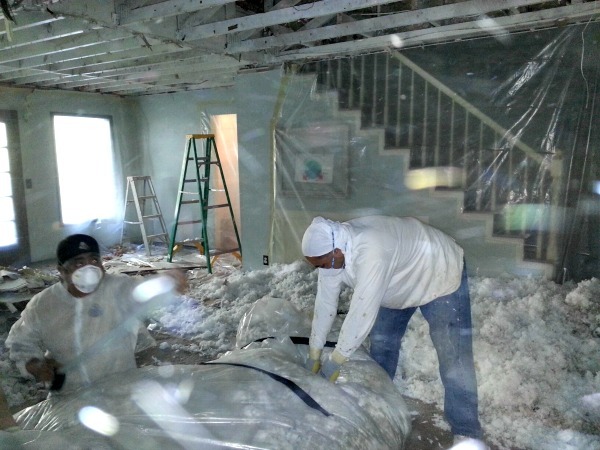 As he was setting out buckets to catch water pouring from our ceiling, the ceiling, and a ton of wet insulation, fell on him, knocking him to the ground. We are so blessed that he was standing straight up or right in the middle of the 6′ x 5′ opening. Could you even imagine how seriously hurt he could have been? 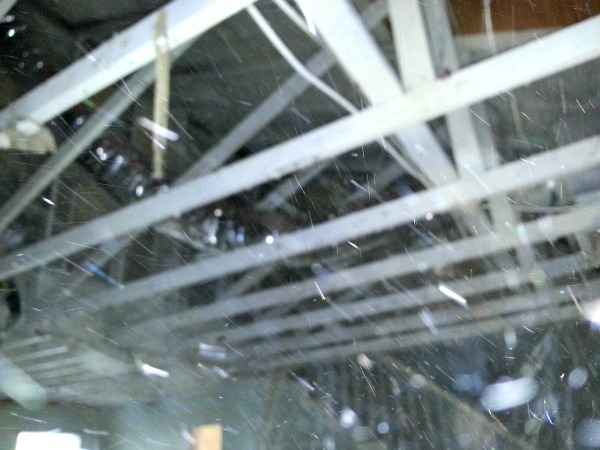 So, that perfectly “cut” piece of the ceiling was not cut at all, it was an entire piece of sheet rock that gave way from the weight of the insulation. 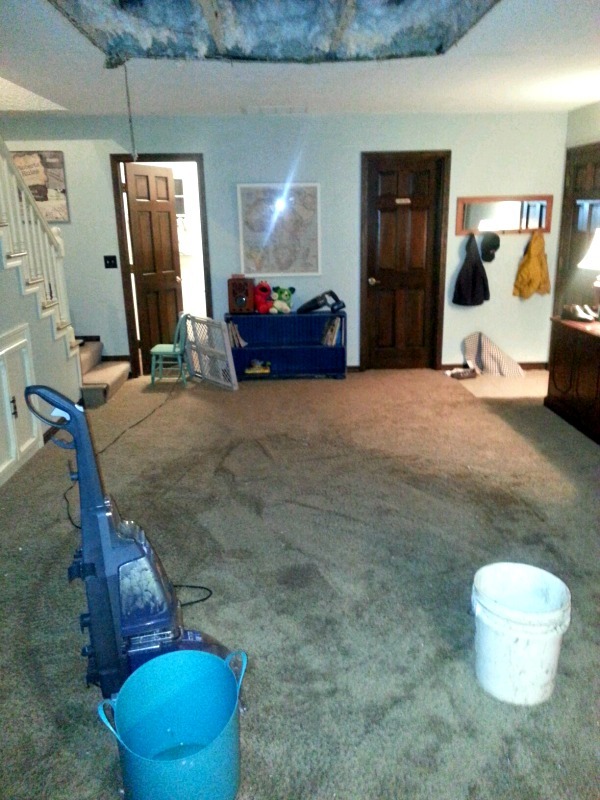 We spent a good 2 hours cleaning up and sucking up gallons of water from our new carpet. Ugh. 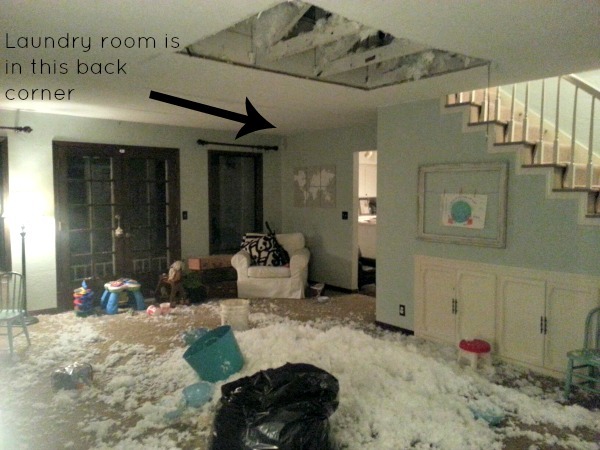 Of course, it had to be the only room that we had removed the popcorn ceiling from. We then called it quits and went to bed to get a couple of hours of sleep before a sick kid woke us and then another one a little later. The next morning we called the water damage people and they went to work. They removed the ENTIRE ceiling in the playroom, the flooring in the laundry room, a foot of sheet rock all the way around the laundry room walls, and of course, sucked up more water and removed our carpet pad. When they left, they left huge and very loud fans to dry out the flooring. It was all a bit too much for me. The playroom is our only truly child-proof room and trying to keep the boys in control in the rest of the house was exhausting – not to mention the naps that don’t take place with the noise of the fans. 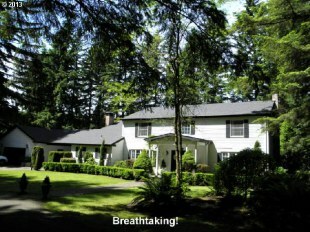 We took off to the lake house – thank you, God, and Grandma and Papa for the lake house. We’ll head back tomorrow for the boys soccer game and hopefully the fans will be removed Sunday. Then, on Monday, we can start to put the house back together. This is not exactly the nesting I had in mind. Fixing stuff that was perfectly fine for the time being. There is some silver lining however. We’ve been saying that we need overhead lighting in the playroom, but didn’t want to cut into the ceiling and have to patch it. That concern no longer exists since umm.. we don’t have a ceiling at all. Oh, and we finally figured out why all the wood in the attic has been painted white. Our house nearly burnt to the ground in ’78. Painting the wood helped to remove the smell of smoke. Nice. 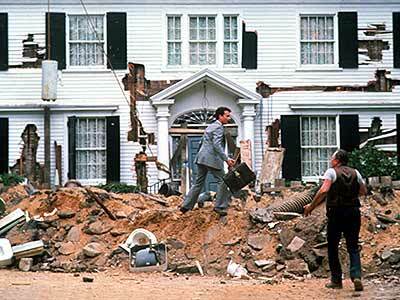 If you haven’t already noticed on your own, our house very closely resembles the house from the movie The Money Pit. This was the listing photo. I need to get an updated one. We had to tear out ALL of the hedges and most of the bushed and trees in front of the house because they were brown and dead when we bought it. We thought it was just the wet winter and they were spring back. Ha.